Silver Label Aquarium Silicone is special formulation for fish tank construction and/or repair. Adheres to dry, clean and grease-free glass. Fill the aquarium with water ONLY after sealant is totally cured. Vulcanisation rate 1-2mm /24 hours. Clean excess with white spirit - use only in well ventilated areas. Keep away from children. Avoid contact with eyes and skin. If contact with eyes, rinse thoroughly with water & contact doctor. Silver Label Aquarium Silicone Technical data. No longer need you worry about sealing that Pond liner and installing a Bottom Drain use Silver label Silicone Sealer and it will never leak. For best results clean all surfaces to be free of grease, algae, etc. 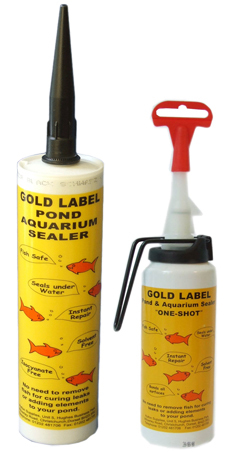 Place Gold label Underwater Sealer directly onto the surface you wish to bond/seal. 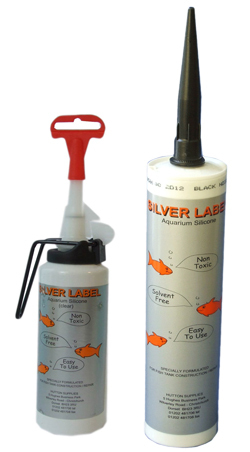 Silver label Silicone Sealer is completely safe for the fish or any other pond life. Silver label Silicone Sealer for Full cure needs 24 hours, initial tack 2-3 hours. Silver Label Silicone Sealant, which cures rapidly on exposure to moisture vapour to form a resilient elastic silicone rubber. We have all got to much excess sealant on the job in hand at sometime or another, its a nightmare to try and wipe it off without it going everwhere, not any more! Gold Label Cleaning Solvent will remove excess sealer, soak a cloth with the solvent and wipe excess sealer from surface. Can be used to remove contaminates (eg grease) from surface before applying sealer. Gold Label Full Arm length Gloves will give you the protection you need for those messy cleaning jobs, made from touch sensitive hypoallergenic vinyl, so ideal for those tricky jobs! Protects you whilst cleaning your pond etc. Pull off a length of Pipe Repair Tape and stretch tightly around the pipe. If there is water pressure in the pipe, make a few extra turns for a secure repair. Need to seal a leak on your pond liner, look no further! Using Gold Label Underwater Sealer, run a continuous bead 5 mm from edge and another bead 20mm inside of that. Gold Label Liner Patch is available in 3 Sizes, great for those jobs where you really dont want to buy a new liner costing you a small fortune! Polyflex is a one part moisture curing polyurethane sealer which stays elastic when dry and is ideal for use to seal surfaces permanently exposed to water. The easy to use cement additive that makes your pond smoother, stronger and crack-resistant. Building a concrete pond has never been so easy. Wizard Fibre has been in use for decades in specialised architectural and construction projects where very high performance is required to withstand sustained stresses or harsh conditions and where long service is important. Wizard Fibre is a very fine glass fibre designed specifically for mortar or concrete reinforcement. It has been in use for decades in specialised architectural and construction projects where very high performance is required to withstand sustained stresses or harsh conditions and where long service is important. The addition of Wizard Fibre has several long-lasting benefits, with the bonus that it is very easy to use. The fibre matrix and the fact that there is a high cement content means that the mix is very sticky but creamy in texture. It flows and adheres to the wall much more easily than a traditional mix. This brings the practice of concrete pond-building within the scope of the average hobbyist, thus saving a considerable amount of money. When the final Wizard render has set and dried it can be painted with a proprietary pond paint. The special characteristics of Wizard ensure that it disperses evenly in the mixer. The product appears to be in flat strips but when water is added and it is subjected to the action of the mixer, all of these strips break into much finer strands. As these are so fine they do not present any kind of hazard if some of them are protruding from the final finish and therefore they do not require any further attention. 1 - 2% fibres added to the total mix by weight. We recommend the use of a mortar plasticiser in the mix (available at builders' merchants) because it makes application easier. A 1kg pack of Wizard Fibre can cover 8 - 18sqm at 5mm thick. 5 litres cement, 15 litres sand, 225 - 450g fibres. These polypropylene fibres have been used in cement renders for over twenty five years, they are mixed into the render and the random alignment of the fibres increases its tensile strength which prevents cracking and flaking. The high cement content also reduces the permeability of the render. The render is applied directly to the concrete block walls of the pond at 5 to 8mm thick with a 1 kg pack providing sufficient material to 10 square metres. Rein fibres are mixed in with sand and cement. Full instruction for use are supplied with each pack. Skeleton guns for 310ml and 380ml cartridges. High Powered Gun which is easier on the hands for the regular user, ideal for sealing round pipe joints and flanged fittings such as bottom drains in liner ponds. PTFE Thread Sealing Tape is a toolbox essential for ensuring threaded seals are water-tight. Wrap around the thread 10 times.